You wake with a start in the middle of the night. Someone is banging on your front door. A gas main has broken one block over. You have 10 minutes to get out of your house. What do you do? 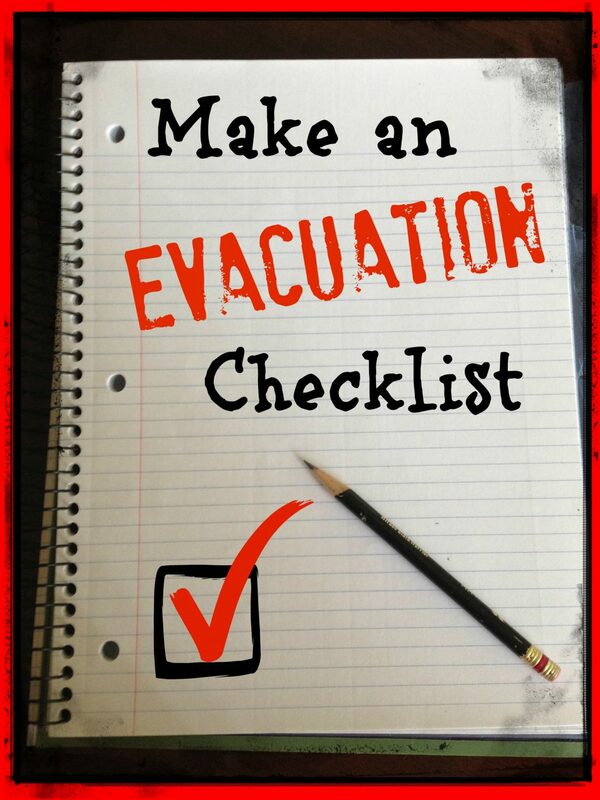 An up-to-date checklist for evacuations is the key. How you respond to a scary scenario depends on a wide variety of things, but comes down to one key factor: How prepared are you to leave your house? During a wildfire event several years ago out west, our friends had to evacuate their home. They initially believed their home would be safe but an unexpected shift in the wind required them to leave very quickly. They were not at all prepared but loaded up their minivan, drove out of harm’s way, and to a community shelter. Fortunately, their home was spared and they were able to return two days later. When they unpacked their car, they realized that what they took out last was what was packed first. What was it that they, in their panic, decided to put into the car first to save it from wildfire? You know what never made it into their car? Their important paperwork that was in a filing cabinet, which wasn’t fireproof. They simply weren’t prepared to evacuate and when suddenly told to get out, they weren’t in a proper mental state to make the best decisions. With some events, like a hurricane, you may have hours or days to plan how to leave your home and to get packed up. Other incidents like a broken gas main, nuclear power plant incident, or a chemical spill require you to leave quickly and usually come with no advanced warning. Being told suddenly you must leave your home is no time to be making important decisions regarding what to put in your car. Know how to plan for 2 types of evacuations: urgent and planned. Below is our list (made more basic and a little less personal for this article) that we’ll use upon deciding to evacuate our home. Since we have teenagers, all items on the list can be performed by anyone. If you have younger kids, you may want to have a separate list of things they can do. Our plan is that one person controls the list and assigns the tasks. When a job is complete, the person gets the next task. Each action is placed in order of importance in case the entire list can’t be completed. If time has run out, we drop to the “Final Actions” portion and go. Each family member has a list of three or four “personal items” that they want to have during the evacuation. This not only helps packing go more quickly (again, because the decisions have already been made), but also ensures that if someone isn’t home, the others can grab the correct items. For my family, these items include specific photo albums, laptop computers and external drives, stuffed animals, and prized possessions. Use this Last Minute Checklist for items that can’t be pre-packed, such as medications. Be sure the list is somewhere accessible to all. We keep ours laminated and attached via carabiner to a bug out bag. As with any preparedness activity, running through a practice drill is the only way to know if your plan will work. Set aside some time when your family doesn’t expect it, and announce, “EVACUATION DRILL!” Go through the entire process of actually loading these things into the car just as if you are actually leaving your home. Set a timer and see how long it takes to get through the whole list. You may discover that moving a supply bin is a two person job, or that items must be placed in your car in a particular way in order to fit everything in the trunk. You don’t want an emergency to be the first time you test your list and your family. Not only does an evacuation list provide you with a pre-determined plan that will ensure you have what you need when you leave your home, but it will also help alleviate panic in the process. As you lead your family to safety, you’ll be doing so in a more calm manner, which will help everyone around you remain calm as well. Evacuating your home will be a stressful time, but with a bit of preparedness, it doesn’t have to be a time of chaos. Want a checklist as seen in this article? Click here! IVE BEEN AT WHAT USE TO BE CALLED FOOD-STORAGE FOR 40 YEARS NOW. THE MORE I GET READY FOR WHAT COULD HAPPEN THE MORE I FOUND I WAS NOT READY. YOU ARE NOT READY WHEN IT COMES DOWN TO THE FINAL PUSH. BUT WE DO THE BEST WE CAN. MY BISHOP PULLED ME ASIDE 2 WEEKS AGO AND WE TALKED, ALOT.HE ASKED ME ABOUT WHAT I HAVE DONE AND ASKED ADVICE OF WHAT HE COULD DO. HIE IS NEW TO OUR WARD, BUT WHAT IT CAME DOWN TOO WAS FEAR OF AN E.M.P. AND IT FRIGHTENS HEM TO DEATH. I TOLD HEM NOT TO WORRY ABOUT THAT FOR NOW BUT A ECONOMIC CRASH IS THE FRONT RUNNER IN MY BOOK. HE CAME OVER MY HOUSE LAST WEEK AND WE TALKED FOR 3 HRS ON HOW TO GET PREPARED AND I FOUND OUT THAT MOST OF THE PEOPLE IN MY WARD HECK IN MY STAKE ARE NOT EVEN PREPARED FOR 2 WEEKS OF READINESS. HE ALSO ASKED WHEN SHOULD HE KNOW ITS BAD AND WHAT TO DO. I TOLD HEM WHEN HE SEES A LARGE TRUCK BACKED UP AT MY DRIVE WAY ITS TIME TO GOOD. FOR THE LOVE OF YOUR FAMILY FOR THE LOVE OF AMERICA AND FOR THE LOVE OF GOD GET READY NOW. TIME IS SO SHORT WE DONT HAVE ALOT OF IT. Excellent information! I’m so happy Pinterest led me to your site. I have been preparing mentally for an EMP or other event but its time to put this in action. This list helps me to get started now! Being prepared during calamities and emergency situations will help you make the right decisions. It is better to be prepared now a days rather than to be sorry in the end.